Everyone becomes just a little Irish on St. Patrick's Day. In mid-March Phoenix has St. Patrick's Day parades, runs, and other fun events. Enjoy Irish music, dance, and frivolity throughout the Valley of the sun in 2019. Looking for a pint of Guinness or a plate of corned beef and cabbage? Try one of these bars or restaurants with special deals and festivities on St. Patrick's Day. They call it "The Greenest Day in the Desert." The St. Patrick's Day parade has marching bands, Irish step dancers, bagpipers, police and fire vehicles, government dignitaries, floats, and the Arizona Irish Colleen with her Court. In 2019 the parade kicks off at 10 a.m. on Saturday, March 16 at 3rd Street and Sheridan and heads south through Downtown Phoenix. After the parade, the Irish Family Faire begins. The 2019 Phoenix St Patrick’s Day Faire begins at the Irish Cultural Center at Hance Park. You'll enjoy three stages of Irish music, Irish step dancing, and bagpipers. There will be plenty of food and drink for sale and a VIP Pub hosting Arizona Craft Beers. The parade is free. Faire Admission is $12.00 for Adults, $10.00 for Senior (55 & over) and Military, and Children 12 and under are free. You can purchase tickets online. With your ticket you can get free parking at the garage located at 1850 North Central Avenue and a shuttle is provided. All the festivities take place in Central Phoenix. Saturday, March 16, 2019, at Westgate Entertainment District in Glendale, Arizona. Celebrate St. Patrick’s Day with a half marathon, 8k run or 4k run/walk. Celebrate with live Irish music and costume prizes. Enjoy a post-race party. Registration fees vary according to distance chosen. There are finishers medals for all. On the day before, the Friday night Kilt Run will take place, supporting the American Cancer Society. You can bring your own kilt or wear the one provided. Your entry includes a kilt, finisher’s medal, cold beverage and admission to McFadden’s St. Patrick's Party. Yes, the famous fountain in Fountain Hills, Arizona will turn green. Fountain Hills invites everyone to come to Fountain Park at noon on St. Patrick's Day to watch the green fountain spout 560 feet (170 m) into the air. You can “Experience Ireland” at MIM, the Musical Instrument Museum in North Phoenix. It will be two days of Celtic-inspired fun including Irish music, crafts, Irish dancing, and storytelling. Performances and activities (not food) are included with paid museum admission. Saturday, March 16, 2019, 9:00 a.m.–5:00 p.m.
Sunday, March 17, 2019, 9:00 a.m.–5:00 p.m.
Make plans to experience Ireland at MIM’s celebration of Irish music and culture. It’s a perfect way to celebrate Saint Patrick’s Day. Experience a full weekend of authentic Irish activities, including an Irish tea ceremony, Ceili dancing, and traditional Irish music. The events kick off on Friday, March 15, 2019, with Ceili at 7:00 p.m. A Ceili is a family-oriented Irish social dance. On Saturday, March 16, 2019, The Irish Cultural Center will be hosting Irish Tea Ceremony sittings with paid admission in addition to Faire entry. On St. Patrick's Day, Sunday, the center offers special programming from noon to 4:00 p.m. including a book sale and half-price tickets to their exhibit. Families can visit the Castle Keep for Family Story Hour to make fun Irish crafts and read The Story of Saint Patrick’s Day by Patricia A. Pingry and​ The Leprechaun Under the Bed by Teresa Bateman. There will also be musical entertainment and Irish programming onstage. Tea will be available for purchase. In the Courtyard, there will be a cash bar, games, and display of musical instruments (try one out). New this year, they will offer quiet sensory-friendly programming for a calm, quiet environment as an option. Tickets are available at the door. Admission: $6, one child 12 and under free with each paid adult. Local and regional foods will be available for purchase. Beer, wine and cocktails will be available throughout the grounds and VIP areas with some special St. Patrick’s Day themed cocktails are offered at select bars. There will be free water stations. 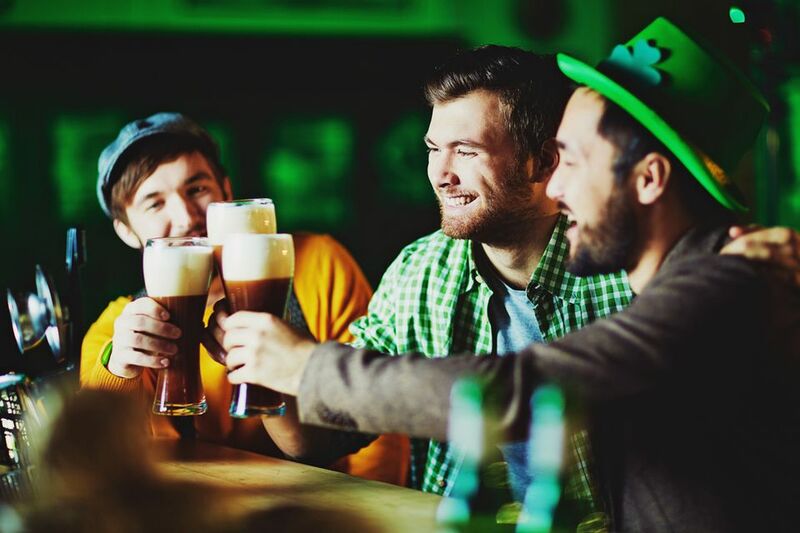 You can probably find about a thousand bars that will serve Irish Whiskey and Irish stouts, but some of the Irish pubs, bars, and restaurants around the Phoenix area have even more than that, with special events and/or entertainment for your St. Patrick's Day revelry. Even if it isn't St. Patrick's Day, the craic is mighty in Phoenix all year long at these Irish pubs. Head for the Chandler Center for the Arts in downtown Chandler for a free concert on St. Patrick’s Day with Skerryvore, an eight-piece band that creates music which is a fusion of American folk, rock, and traditional Scottish music. This Scottish band has received a long list of prestigious awards and has performed at arts centers and festivals all over the world. If you like country music, or if you love Irish music, you'll enjoy Skerryvore. General seating is on a first come, first served basis. RSVP to attend. The concert takes place from 7 p.m. to 9 p.m. Go early and enjoy a glass of beer or wine before the event. Ride a motorcycle? You can have a great time and raise money for a worthy cause on Saturday, March 16, 2019. ACCEL (Arizona Centers for Comprehensive Education and Life Skills) is a private, nonprofit organization serving children and adults with developmental disabilities. Tickets are $25 for riders and $10 for passengers. Each rider will receive a special ride patch and other ride souvenirs. If you are coming from out of town, the official event hotel is the Delta Hotels Phoenix Mesa Marriott located at 200 North Centennial Way, Mesa, AZ 85201. There is a discount for ride participants. It's Tall. It's Green. It's in Fountain Hills.